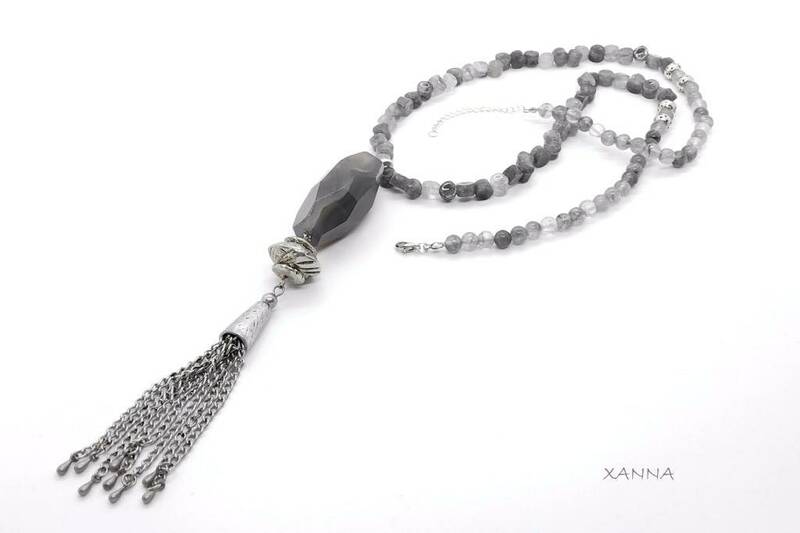 Grey cloud quartz beads with silver beads and agate pendant with metal tassel. 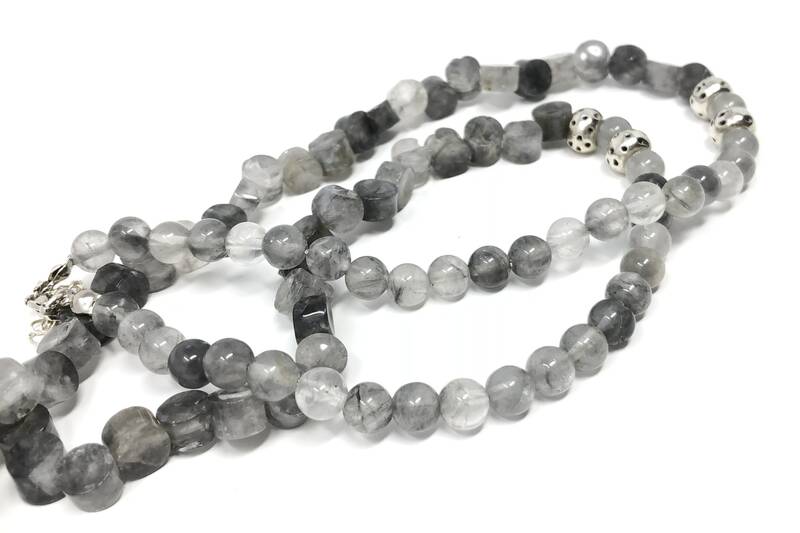 In India, Nepal and Tibet wore agates with straight stripe and carved them to make amulets, these peoples called agates as stones of science, with it the Indians thought they could cure the diseases of the eyes and agates whose interior was Stuffed with water (eagle stones) They were used as pregnancy protectors. The Egyptians wore the agates to counteract the bites of spiders and scorpions, this village also put Agate in the mummy's ocular basins. In Islam an agate ring guarantees a long life. It is said that it helps to have an idea of life in a calm way, helping to solve the own issues in a collected and concentrated way. It helps to obtain maturity and spiritual growth making us more stable. Emotionally agate transmits protection and safety. Mentally empowers logical and rational thinking, stimulates concentration. 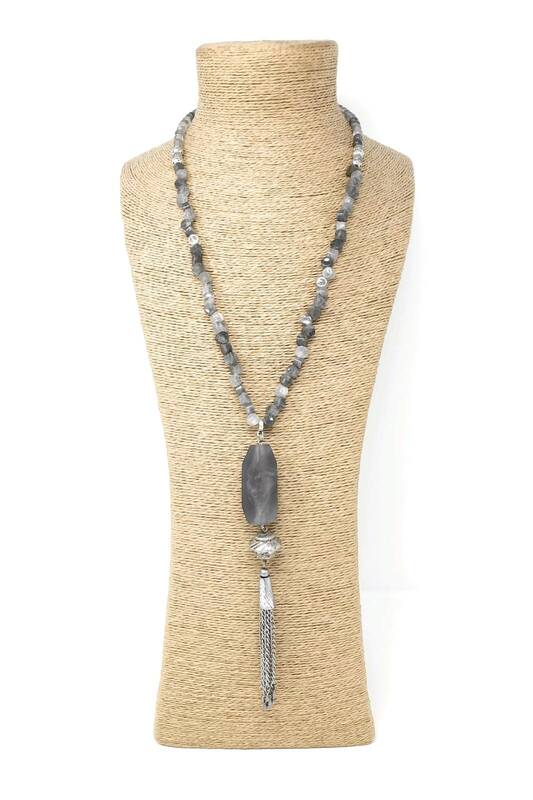 Rock Crystal Stone. Quartz is a silicate (silicon and oxygen) and is the most abundant mineral on earth. It is the stone of health, so called, for its curative and preventive properties.